The efficient functioning of the skin, which is part of the immune system, is essential to good health. The skin and hair protects the body from trauma, temperature fluctuations and microbe invasion. The skin is also the largest organ of elimination being responsible for excretion of waste products and water together with the kidneys, lungs and bowels. If the skin is not functioning correctly, this will put stress on these organs. The skin also prevents dehydration, carries sensory nerve receptors and synthesises Vitamin D for absorption in the body. Any injury to the skin is a possible site for bacterial and fungal infection. Signs of health deficiencies reflected in the skin and hair are rough, dry, brittle or dull coats, washed out colours and scurf which is like dandruff in humans. Causes are usually endo-parasites, worms (internal), ecto-parasites (external) such as ticks, lice and mites, nutritional deficiencies, dehydration and also many disease pathologies. 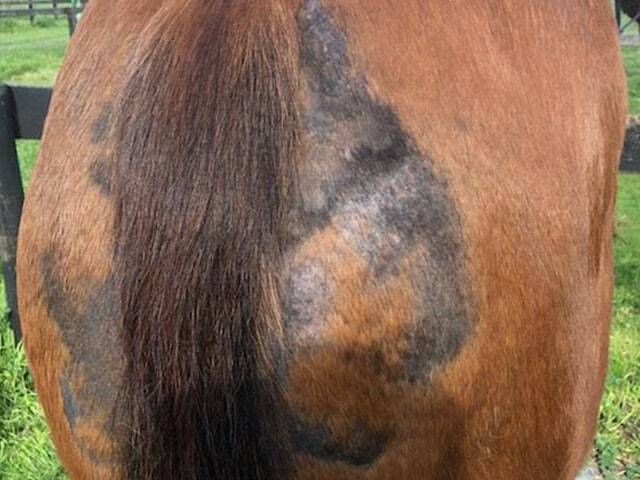 Dermatitis is an inflammatory condition of the skin caused by an external influence which has set up the irritation. Causes include hair dyes, chemical shampoos, insect repellents and coat shine products, even soap powders that have been used to wash rugs and saddle cloths and bedding. 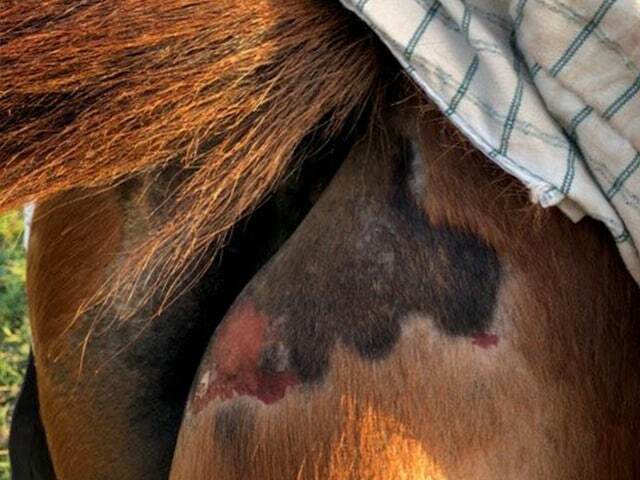 Some horses have particularly sensitive skins and any products containing chemicals should be avoided. Instead use all natural shampoosand insect repellents. 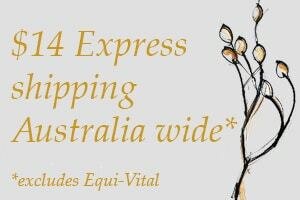 A liquid wool wash containing Eucalyptus Oil is ideal for washing rugs, saddle cloths, bandages and pads. Allergic reactions on the skin such as rashes, lumps, welts, fluid filled swellings are caused by insect bites, vaccine or drug injections, viral infections, ingestion of allergens in feed or drugs to which that particular body has developed a hypersensitivity, proteins in fresh grasses and animal proteins in concentrates. 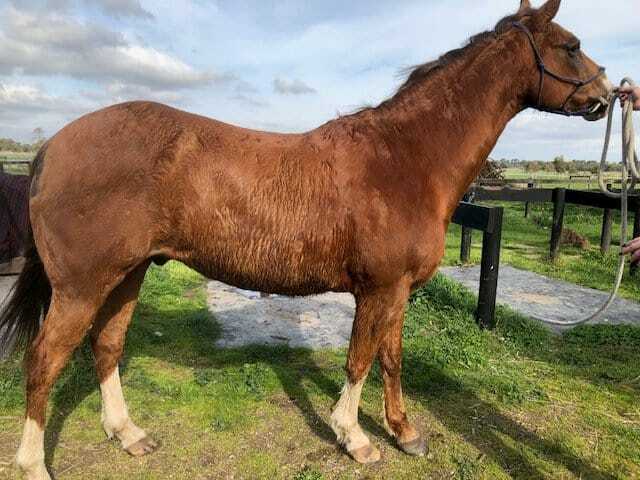 Recently Karen Rietmueller from Berwick in Victoria, asked me to treat her Quarter Horse gelding Prince Harry, yes also a redhead !! 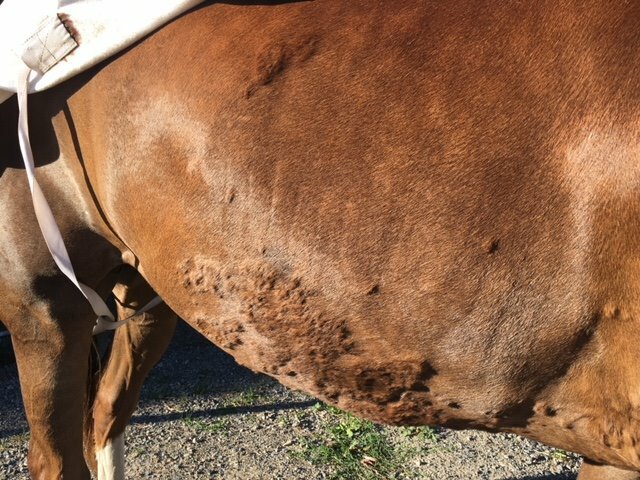 Karen was at her wit’s end as he was not responding to veterinary treatment, and had rubbed huge areas of hair off both sides of his rump and also damaged his skin quite extensively. Harry also had welts all over his barrel and neck. It certainly was an allergic reaction with the test results showing allergic responses to a huge number of allergens. I explained to Karen that I would prescribe a holistic herbal prescription of liquid herbal extracts for oral syringing, to dampen down his immune response, stimulate the circulation to the skin and provide liver and kidney detoxification and of course to reduce the itchiness. Topically I prescribed my Artisan Skin Balm and Orlando’s Coconut & Lemon Myrtle Shampoo. I also formulated a customised VF Natural Diet to support the healing process with natural sources of omega 3 & 6 essential fatty acids most important in this situation. Prince Harry responded amazingly quickly to this herbal treatment and within 3 weeks his skin was healing and the hair was growing back and he was no longer itchy, and the welts had all but disappeared. Skin problems can be notoriously difficult to resolve so it was very pleasing to get such a quick and comprehensive result with Prince Harry. He is now being maintained on his VF Natural Diet and is back in work.